A. In a small mountain town called Fish Camp. 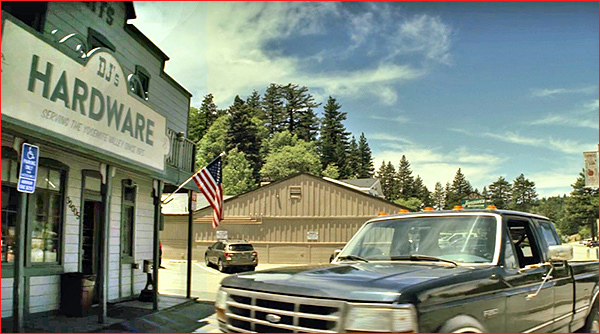 In the final Episode 10 ("Stop"), at 28:55, when we see veteran Walter Cruz ( Stephan James ) walk from his pickup truck towards the building.. 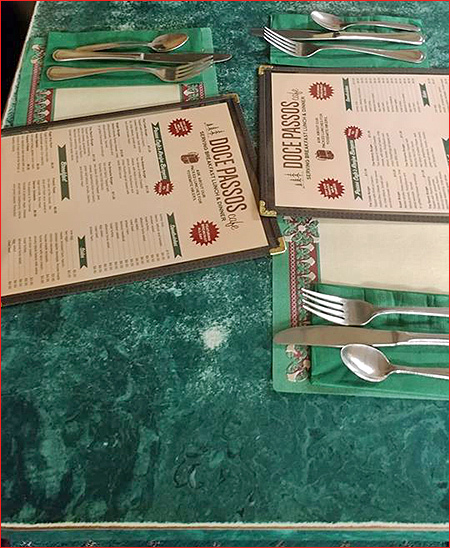 The restaurant has a sign on top that reads "Doce Passos" ( which is Spanish for "Twelve Steps", perhaps a reference to the 12-Step system of fighting addiction to drugs or alcohol. ). 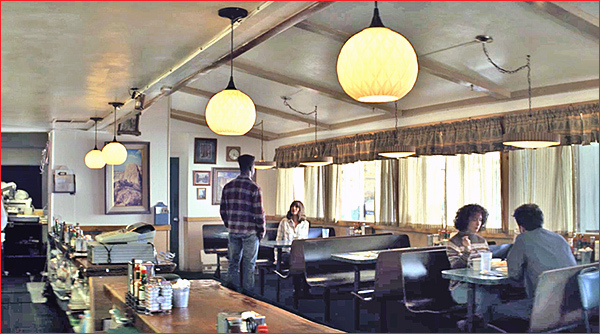 Walter goes inside, and we can see that it's a local diner. 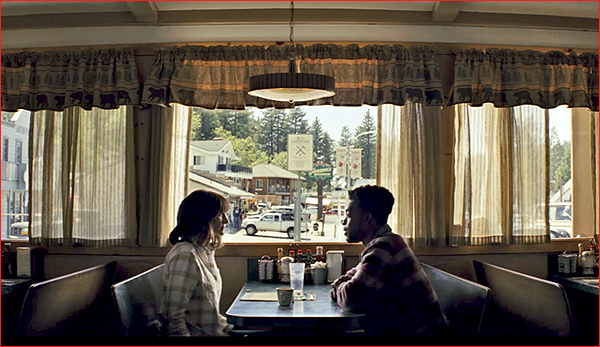 the kind of "little cafe" he and Heidi ( Julia Roberts ) talked about during their sessions, when discussing their fantasy road trip . He sits at the counter and orders coffee from a waitress ( who seems to know him well ), indicating he's probably a regular at this neighborhood cafe. He turns, and sees Heidi sitting at a booth. 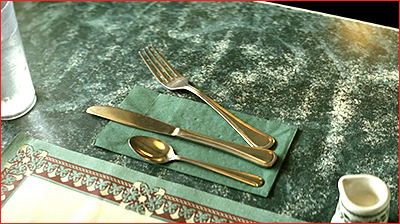 She has her silverware positioned neatly in a row above the placemat, the same way she used to carefully position the items on her desk at Homecoming. Walter doesn't seem to recognize her. 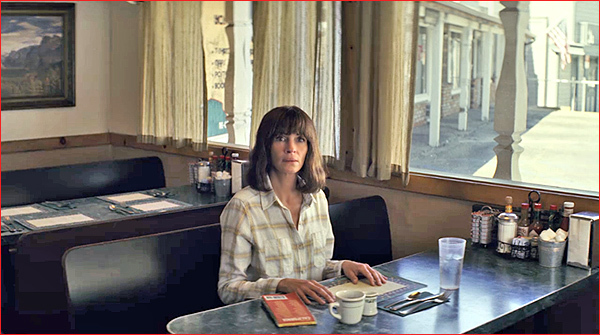 But as two lone diners in an uncrowded restaurant, far from the beaten track, they strike up a cordial conversation about where she came from, and he sits in her booth as she tells him she drove from Florida. At the end of the conversation, they shake hands, and Walter heads his nearby home to continue work on his deck. As she watches him walk out to his truck, Heidi seems happy to have learned that Walter has successfully found a home in this remote town, as he had dreamed about, yet she is simultaneously sad that he has apparently lost all memory of her. In the show's final shot, Heidi looks down, and we see that Walter has slightly moved Heidi's fork out of position, the same way he used to playfully move the things on her desk at Homecoming. She looks up quickly, wondering... and the show ends. A. This is actually the Old Country Coffee Shop, located up in the mountains above Los Angeles, near Lake Arrowhead, in a small town called Running Springs, CA. 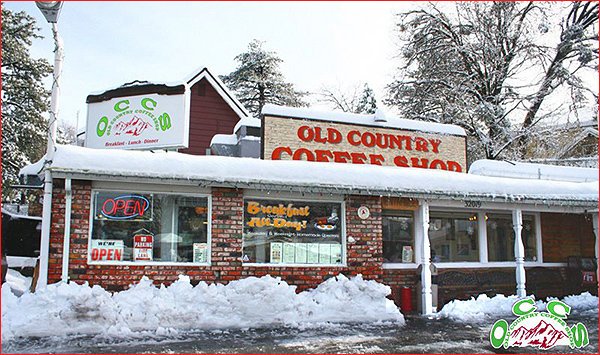 The address of the Old Country Coffee Shop is 32019 Holiday Lane, Running Springs, CA. Running Springs is located up in ski country, about 6 miles southeast of Lake Arrowhead, California, and about 8 miles southwest of Big Bear Lake. It's 80 miles from Los Angeles (or an hour and a half drive). The small town has a population of less than 5,000, is located at an elevation of 6,109 feet above sea level, and takes up about four square miles between those two popular vacation lake spots. Running Springs is the home of the Snow Valley ski resort, the oldest ski resort in these San Bernardino mountains. And ironically ( if Wikipedia is to be believed ), the original name of that Snow Valley area was "Fish Camp" ( because of a fishing pond located there ). A. I have to be honest, this isn't the sort of location I would normally have been able to track down my own, starting from scratch. I wouldn't have even known where to start. But fortunately, I heard reports that Julia Roberts was this series filming up somewhere in the Lake Arrowhead area, which at least gave me a place to start looking. 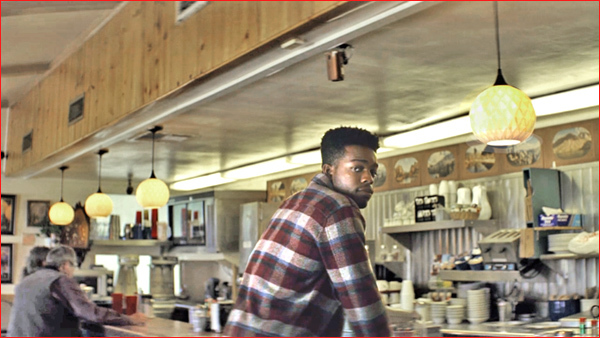 Then, in that diner scene, I spotted a street number visible just above the diner's front window, in the establishing shot, as Walter is walking towards the cafe. When I enlarged the screencap, the number looked like 32019. So, I Googled "32019" and "diner". 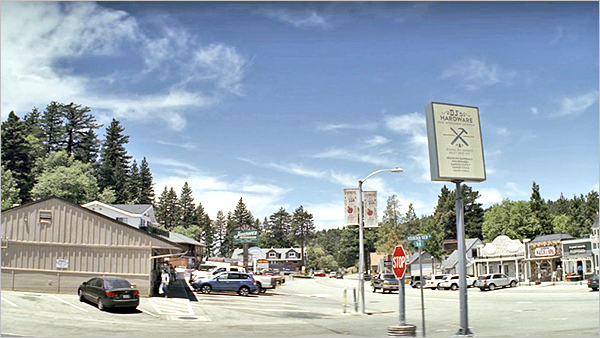 And the first thing that popped up in the search results was the Old Country Coffee Shop, near Lake Arrowhead. TV series drama homecoming starring Julia Roberts it's coming out tomorrow november 2nd on Amazon Prime so why are we excited. Okay well for those who know and for those who don't know they film up here in the mountains including Running Springs and they film inside the old country coffee shop we had a shut down for 3 days so they can film a scene in the parking lot and also inside the restaurant and there you some local customers from the mountains as extras as well as some of the stuff from the restaurant. We got dress as cooks and servers so we're all excited to see if they even show us or not but we're still happy that they film inside the old country coffee shop so we'll see Julia Roberts and the rest of the actors inside the restaurant so we'll see. 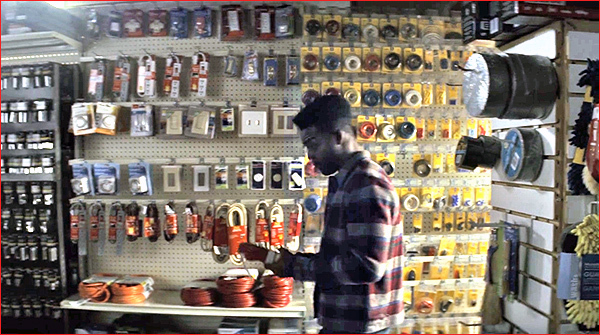 That "DJ's Hardware" store that Walter visits just before he goes to the diner ? It's on Heidi & Walter's list of three things their ideal small town would have: "gas station, hardware store, little café…"
We first see that "hardware store" at 28:35, when Walter goes inside and buys an outdoor extension cord, before coming out and heading across the parking lot to the diner. 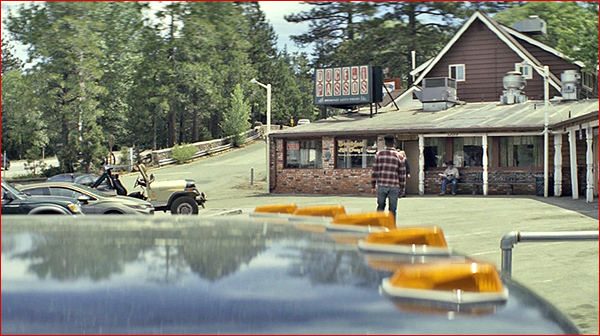 Obviously, you can tell from watching the scene that this hardware store is right next door to the diner ( the "Old Country Coffee Shop" ), and that it shares the same small parking lot. So once you've found the diner ( which we have ), the location of this one is a given. But if you're curious for exact details, this "hardware store" is actually an auto parts store. It's called Hilltop Auto Supply, and the official address is 32005 Hilltop Blvd, in Running Springs, CA. The"DJ's Hardware" sign we see in the parking lot ( like the "Doce Passos" sign on top of the diner ) is fake. If there's one thing studio design facilities are really good at, it's making authentic-looking signs. And interestingly, there is an interior StreetView tour available of this auto supply store, which let's you go inside and look around. Click here to see inside.